Josh Smith claimed two early wickets for Market Deeping at Nettleham. The mood in the camps of two local Lincs Premier Division teams couldn’t be more different right now. While Market Deeping maintained joinnt-top spot with an ultimately comfortable five-wicket win at Nettleham yesterday (May 21), Bourne were losing by 53 runs at a Grimsby team that started the day in the bottom two. Tom Dixon scored 29 for Bourne at Grimsby. Raw opening bowlers Josh Smith and Dan George each claimed two early wickets to leave Nettleham reeling at 33-5 before the home side made a partial recovery to 129 all-out. Tidy off-spinner Meli Adatia (3-23 from 13 overs) ensured the rdest of Nettleham’s batsmen never managed to break free. Deeping wobbled slightly in reply once Dan Bendon was dismissed for 34, but from 80-5 wicket-keeper Dave Sargeant took charge to steer Deeping to victory without further loss, in partnership with Adatia whose 10 not out occupied 62 balls. Sargeant struck seven fours as Deeping kept pace at the top with Grantham who won by six wickets at Skegness. Bourne are sixth, 23 points behind the leaders, after performing well below par at Grimsby. Grimsby limped to 20-3 before Steven Crossley (80no) and Joe Farmery (52) counter-attacked and pushed the home side up to 209-8 in their 50 overs. Opening bowlers Matthew Kidd and Colin Cheer took three wickets apiece for Bourne. Bourne also started poorly - they were 37-4 - but didn’t recover anywhere near as well. 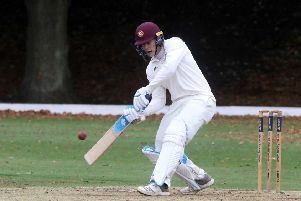 Captain Peter Morgan struck a six and six fours in his 19-ball 33, but only Matthew Kidd (38 from 33 balls) and Tom Dixon (29 from 28 balls) contributed much in a team total of 156 all out. Nettleham 129 (M. Adatia 3-23, J. Smith 2-21, D. George 2-23, D. Bendon 2-24). Market Deeping 132-5 (D. Sargeant 40no, D. Bendon 34).